Sorry to have disappeared for so long. I went outside to organize my garden by color and got a little obsessed with the process, coming in too tired to blog. I’ll share some photos as soon as the plants recover enough to look like anything. 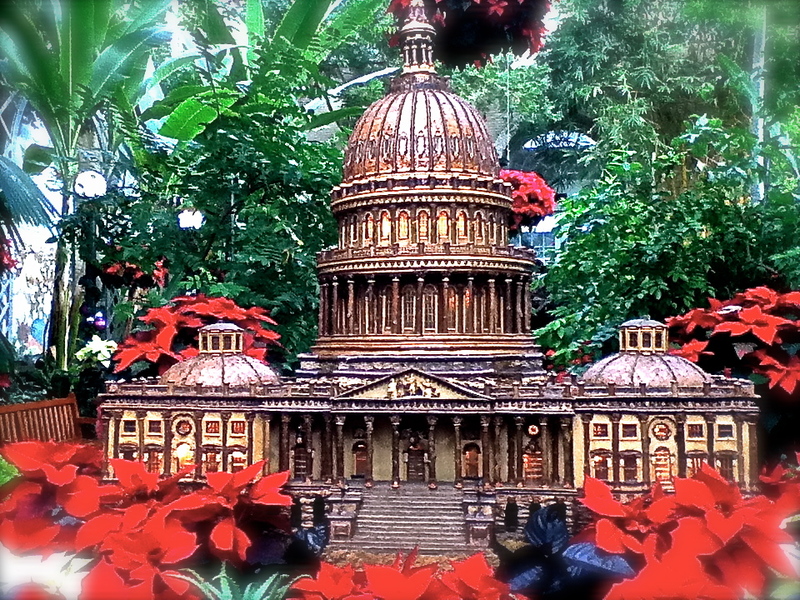 A model of the U.S. Capitol building at the U.S. Botanic Garden. All photos by Laura Koran. In additions to wreaths, garlands, and poinsettias, the indoor display features model trains running by fairy dwellings in an enchanted forest. The design company Applied Imagination also created models of many of Washington’s landmark buildings (and one fountain) using dried plant materials (supported by acrylic foam boards). The show will be open to the public through January 1, 2013, and admission is free. There’s an interesting behind-the-scenes video of the U.S. Botanic Garden’s year-long preparations for its “Season’s Greenings” display here. This video is not terribly recent — from The Washington Post on December 1 — but I thought artist Cai Guo-Qiang’s take on the season’s traditional tree “lighting” was kind of a hoot. The New York Times had an article last week, here, about the origins of the punch wassail (the word comes from the Middle English phrase waes hael, to your health) and the carol “Here we come a-wassailing ….” They’re actually about singing to the health of trees, particularly apple trees. James Golden’s Federal Twist garden in western New Jersey is just as gorgeous in early winter as in all the other seasons. Please take a look here. Happy holidays to you too, Cindy! Thanks for sharing so much cool and thoughtful stuff this year. We’ll miss you both next week. Happy Holidays and have fun on Friday!